Previous PostThis Thing Called Love (1940)Next PostSCHEDULE: Rosalind Russell Birthday Marathon on TCM tomorrow June 4! Well done, love the back story. Couldn’t agree with you more, comedy & drama are my favorites, action/adventure not so much. But this is a Roz movie so what the heck. Rosalind is gorgeous and Clark is gorgeous, Peter Lorre not so gorgeous but always an interesting on screen presence. Roz looks wonderful in her Adrian costumes and Clark is dashing in his tux and military uniform (note that his cap & pith helmet are always at a jaunty angle). Too bad the producers didn’t stick to the comedy/romance storyline but in 1941 they must have felt the need to interject a war story. Yeah I think so too–that they felt they had to put that war story in there. That’s how it often was back then. But that’s exactly why I like the beginning more than the ending… that was more fun… but the thing we can always rely on is how beautiful the stars are! 🙂 thank you for reading and commenting, as always! It seems to me that the powers that be didn’t feel comfortable with a scoundrel being the protagonist of the film so they had to redeem him as a war hero. YAWN! I liked the jewel thief Gable much better, corny lines notwithstanding. Don’t forget the dimples, oooh,. It was a wonderfully funny movie and I enjoyed it very much! 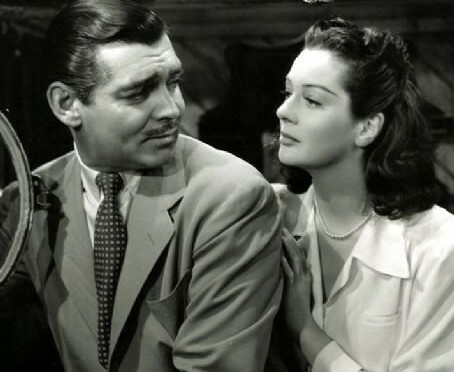 Clark Gable is a natural huckster.